Don't let societal expectations sway you: a purse can be shaped like almost anything. As such, why lug around a boring rectangle when you can store your portable belongings in a giant piece of pasta? 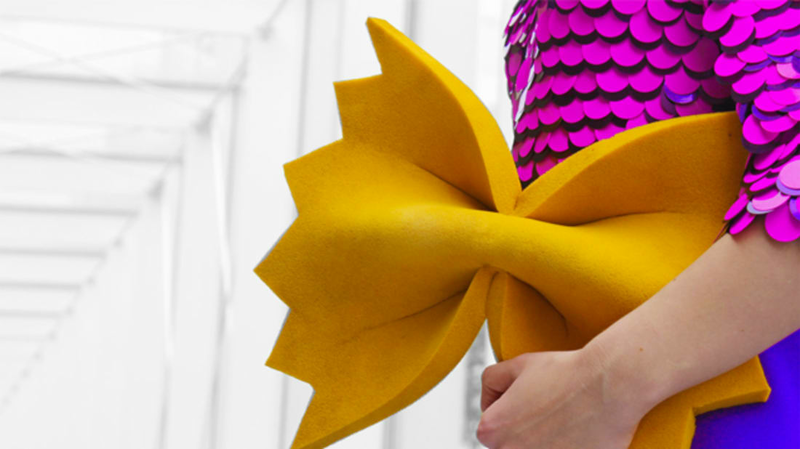 Netherlands-based fashion blogger and designer Rommy makes quirky accessories shaped like colorful junk food. Through her Etsy store, you can find a plethora of eccentric bags, pins, necklaces, and other accessories in unusual shapes. Wear your sugar passion on your sleeve—er, shoulder—with bags shaped like ice cream, cake, and gummies. There's even a line of food-themed bow-ties for the dapper (and hungry). "My designs are full of energy, a complete color explosion with sense of humor. I like to look at products in a different way, and go against the rules, because that will create that unique product!" Rommy writes on her store page. While some of the pieces look a little cumbersome for everyday wear, they certainly add a dose of whimsy to any outfit. You could probably knock someone out cold with the Smarties clutch—but at least you'd look good doing it.